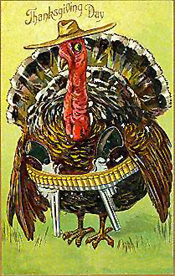 Here's wishing you, your family and OTR cat a wonderful Thanksgiving Jon! And I just want to thank you once again so much for sending me your collection of "Harry Lime" shows! I love them! Harry is one cool detective. And such a well produced show. I will be ordering more various shows from you in the months ahead. I mean one can never have too many old time radio shows on my shelf right? Long live "the Golden Age of Radio!" It truly was the best of times. Thanks for keeping it alive Jon. Take care my friend. I wish you health, happiness, peace and love. This is quite a nice collection. It is nice at this time of year to be able sit an listen to Thanksgiving themed programming in a time when the holiday is almost forgotten in the dash from Halloween to Christmas. Thanks and happy Thanksgiving.